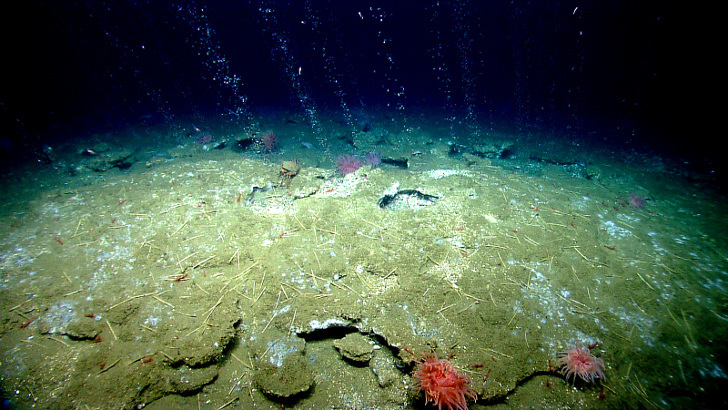 When carbon dioxide is absorbed by the ocean, the water's acid level rises. 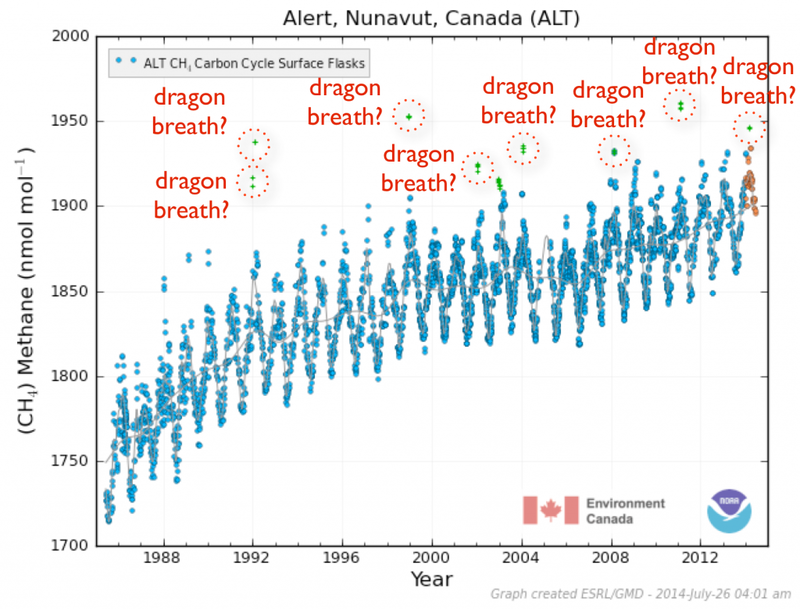 If this level gets too high, some sea creatures that build protective shells can't grow as fast or even have their shells dissolve, threatening the entire food chain. When you cut through a tree nothing seems to happen. Then, inevitably you reach a point where the tree starts to fall, and then a loud cracking and toppling occurs, irreversibly, to a new state. 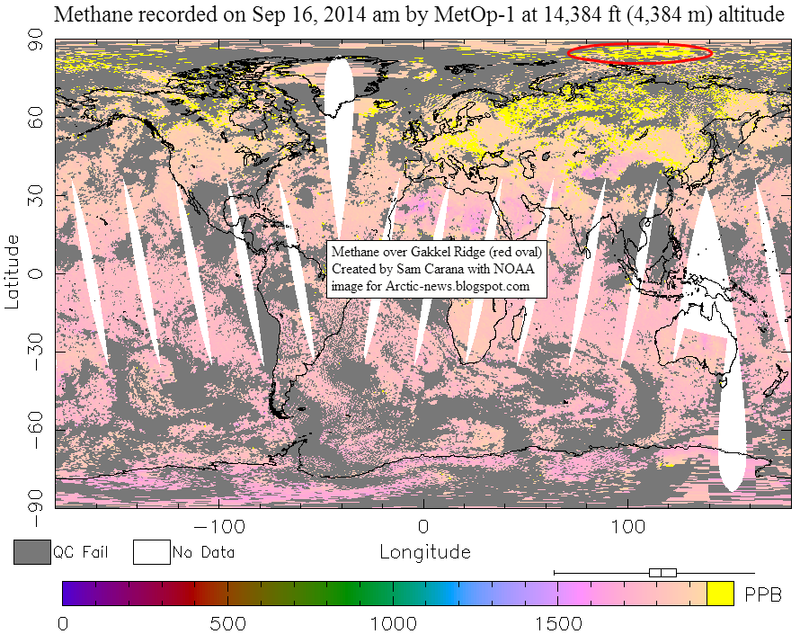 I view our climate system as analogous to this, and we are now rapidly cutting through the wood. Novorossiya map. A highly strategic region., key to many powers to this day. It has been said that a nation is simply the spiritual body that a people acquires during the course of its history. Novorossiya or New Russia, so absent in mainstream media and so present in alternative news sources today, is popularly believed to be a fleeting matter, simply a new name created ex-novo for effect by the local militias of southeastern Ukrainians today fighting and defeating the Ukrainian regular army troops invading their territories. In doing so the people of Novorossiya are also shattering the dream of American President Obama. The truth is the people of this region are closely linked to the history of their lands. According to Alexander Zakharenko, field commander and Prime Minister of the Donetsk Peoples’ Republic (DPR) in southeastern Ukraine speaking at a recent press conference, invaders from West Ukraine run or surrender at the first shot. The American-financed troops, conscripted by force by the puppet state in the Ukrainian capital of Kiev, simply don’t measure up to the warriors of the southeast Ukraine who are defending their lands, their cities and villages, and their families. The point is that the regular army troops are demotivated and scared and want to return to their homes in West Ukraine. Besides, many Ukrainian soldiers do not want to shoot at their fellow countrymen. Therefore they either desert to the so-called Separatists of the DPR, or flee. People following the US-instigated attack on the now adequately armed and experienced militias of the Donetsk and Lugansk peoples’ republics by troops of the American puppet regime installed in Ukraine after the illegal overthrow of the legal government and “regime change” in Kiev will be surprised to learn that Novorossiya has been the name of the territory north of the Black Sea for over 200 years, long before the Napoleonic invasion of Russia. Since Tsarist Russia annexed the area following the conclusion of the Russo-Turkish War in 1774, the area has been known as Novorossiya. Already in the late 18th century Russians, Ukrainians, Germans, even some Italians, and a mishmash of other peoples colonized the region and established major cities such as beautiful Odessa and Donetsk, now the capital of the Donetsk Peoples’ Republic. Time passed. Situations altered. Much happened in this area between the Crimean War (1853-55) and today: western interventions in Russia, Nazi Germany’s invasion and defeat in WWII, Cold War, sanctions against Russia in these days, and the West’s unconcealed envy of Russia’s space, one-sixth of the Earth’s surface and its natural resources. In the historian’s eyes the history of Western relations with Russia has continuously repeated itself since the 1800s into the 1900s and the 2000s. These repetitions, for example the tradition of Allied interventions in Russia, are not the most inspiring aspect of what has happened time and again in our world. A Russian cultural historian, Vladimir Weidlé, whom I once interviewed in Rome, said that the “Slavic-Orthodox world would never be that of Roman-Germanic Europe” because their respective heritages at the outset were so different. He claimed there was not just one Europe, but two Europes, disunited but as strange one to the other as the Arabian world from the world of China. This division between USA/West Europe and Russia amounts to an absolute schism. That schism has apparently fostered, on the one hand, jealousies and envies one for the other. On the other hand the schism has strangely created a sense of superiority in West Europeans and Americans vis-à-vis Russia. A missionary kind of zeal infects the USA to stamp out the heresy of Socialism in the neocon view still alive in Russia, which, in turn, is the “infection” that has prompted some of the western military interventions in Russia. For three centuries the West has assaulted Russia with regularity, in almost 50 year intervals, always seeking to contain her, conquer her, occupy her, exploit her and above all destroy her. However, the reality is that Russia is not Oriental, but also part of Europe, in this case however, a Europe of the East. Despite Arab influences in Europe, Cervantes, Weidlé noted as an example, was not a Moor, nor Pushkin a Mongol. In the same manner the centuries of Tartar occupation of Russia, likewise Lenin with his face of Mongolian cast was not a Tartar. Nonetheless, today Russia’s eyes have turned eastwards because of pressures from the West. Still, the geographical situation of Russia has pointed the path of its expansion and the very shape of the empire, but not the direction its cultural development has taken. Weidlé believed that the invasion of Russia by Asian Tartars changed the very roots of Russia, yet such non-European elements do not really belong to her history but to the raw materials of her nature. The Russian language shows certain analogies to the languages of Turco-Tartary; but Russian developed from Greek, to which was added the influence of the literary languages of Western Europe. The Asiatic influences that appear from time to time in Russia have thus far been fleeting. Here, again, its geographical position on the map assumes important historical importance. When Tsardom finally collapsed in the early 20th century, it had crushed one revolutionary movement after the other during most of the 19th century. Trotsky wrote in his autobiography, My Life, that “the best elements of that generation went up in the blaze of dynamite warfare” (that is, in the blaze of revolutionary terrorism). Tsardom fell to continuing revolutionary fever spread throughout Russia and to the pressures of WWI and the huge losses Russia suffered. In fact, it was the very force of the history of European capitalism and the Russian Revolution that changed everything in Russia. 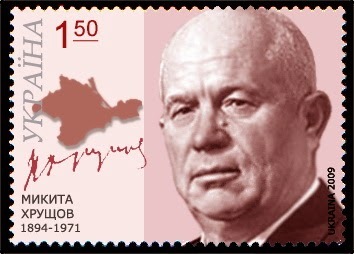 Stamp commemorating Kruschev’s role in giving Novorossiya to the Ukraine. It must be kept in mind that the borders of the Russian world extend significantly farther than the borders of the Russian Federation. There is Russia and there is also “Greater Russia” in the same manner as our big cities today consist of the city proper and the surrounding metropolitan areas. For example there is Paris—the city proper—and Greater Paris, including regions extending in all directions far from the Place de la Concorde. As an example of Greater Russia, in a 1994 interview, the head of the separatist state of Socialist/Communist, Russian-speaking Transnistria, a breakaway state from Moldova, also bordering on Novorossiya, said that that state was “an inalienable part of the Russian state’s southern regions”, including also the city of Odessa, the Crimea, and other Ukrainian oblasts, all of which were collectively part of the historical Novorossiya region. Dmitry Trenin of the Carnegie Moscow Center wrote that in 2003 some Russian academics had again discussed the idea of a pro-Russia Novorossiya state being formed out of southeastern Ukraine as a response to the US Drang Nach Osten—including its desire to bring Ukraine into NATO and the occupation of areas bordering Russia. The former Russian Empire was ultimately vanquished by history. Then also the USSR collapsed because of the economic pressures from the capitalist West during the Cold War, especially the intentional dislocations brought about by the constant arms race. Today, the self-declared Federal State of Novorossiya is a confederation of the Donetsk People’s Republic and the Lugansk People’s Republic. Though internationally unrecognized, both are breakaway states claiming independence from Ukraine. The envisaged extent of the state will most likely one day encompass not only the Ukrainian administrative areas of Donetsk and Luhansk, (in Russian, Lugansk), but also the present Ukrainian cities and surrounding areas of Kharkov, Kherson, Odessa, Zaporrizhi and Dniepropetrovsk as well as the Russian-speaking Transnistria Republic. All of these areas which the USA/NATO threatens border with Novorossiya. The Cold War, and its consequent bloated defense spending due to the US-imposed arms race, was an extraordinary burden on the Soviet economy. It stunted its ability to “deliver the goods”, the fruits of revolution to the ordinary citizen, thereby “proving”, as the Americans claimed, that socialism was inferior. It eventually contributed greatly to the USSR’s implosion. The Novorossiya territory is internationally considered as sovereign territory of the Ukrainian state. Western media write of a southeastern Ukraine run by “terrorists” and moreover backed by the great “Satan” of Russia, Vladimir Putin. Despite Washington’s frustration because of the failure to bring Ukraine into NATO, its neocons remain intent on intervening in Ukraine against Russia, subduing the Novorossiya independence movement, and placing US/NATO Lily Pad-style military bases along Russia’s borders. On a trip backwards through the events of over 150 years we arrive at the Crimea recently annexed by Russia and the Crimean War fought by Russia against the intervention of the first major coalition of Western powers in alliance with the Ottoman Empire to attack Russia. 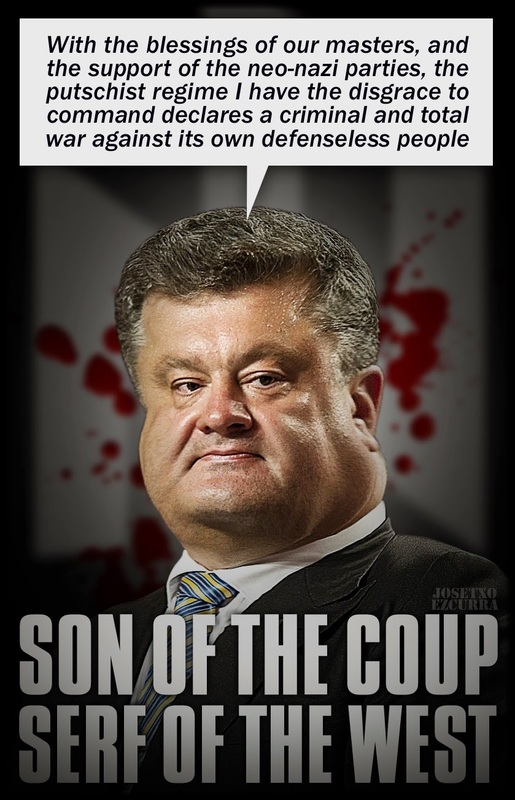 No one should believe easy accusations of Russian guilt in the Ukraine crisis. Western intervention against Russia is an old story. A tradition that has continued until today. Russians had inhabited the territory of southeastern Ukraine between the state of Ukraine and Crimea in the 19th century, shortly after the Crimean War (1853-55) which, by the way, some historians call the real World War I. 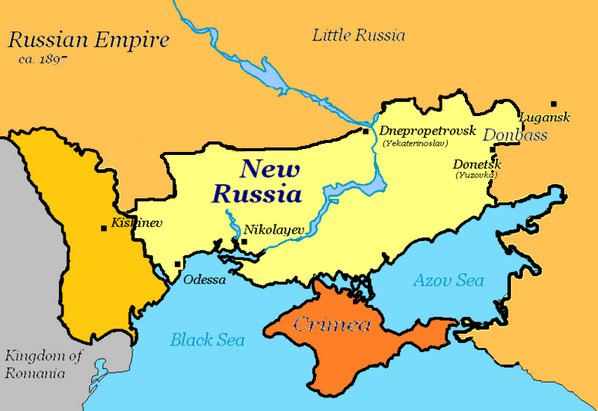 Also those Russians of the 19th century referred to their home territory as Novorossiya, New Russia. The descendants of those first colonists in Novorossiya in today’s southeastern Ukraine have declared their independence from the Ukraine of the West and its capital of Kiev and established the “Donetsk Peoples’ Republic”. Last May it joined with the “Lugansk Peoples’ Republic” to form a new Novorossiya as a confederal “Union of Peoples’ Republics”. The lands of Novorossiya are rich in natural resources—light and heavy industry, minerals and agriculture—and borders on both Russia and on the once again Russian Crimean peninsula and other Russian lands such as Transnistria quite near Odessa. Who today knows much about the almost forgotten Crimean War? In fact that war is often confused with the second Allied Intervention in Russia against the new Communist regime, just the memory of which triggers knee-jerk reactions in Western capitals, especially in Washington where many people and their leaders tend to think of Russians as Communists who fall outside the New World Order. The very idea of Novorossiya constitutes a menace to US strategy for world hegemony. After the Russian Revolution of 1917 while the new regime was struggling for its very survival, the Russian Civil War broke out which pitted the reactionary and privileged Whites—who in general favored the ancien regime of the Tsars—against the Bolshevik-led Reds. The already difficult situation of the revolutionary forces was then further complicated by the second Allied intervention in Russia within a century. So here a few words about the Crimean War are in order. The Crimean War began as another of the series of 19th century wars between the crumbling Ottoman Empire on the one hand and an expansive Russia seeking an exit from the Black Sea into the Mediterranean on the other. The key part of that war began in September 1854 when the coalition of Britain, France, the Ottomans and later the small Kingdom of Sardinia, the core state of the future Italy, landed troops in Russian Crimea located on the north shore of the Black Sea. As the historical name indicates, most of the war was fought in Crimea. The Allies began a year-long siege of the Russian fortress of Sevastopol. However, besides Sevastopol, the Anglo-French fleet attacked areas on the adjoining Azov Sea and in the Caucasus. In a forgotten part of the forgotten war, the Allied fleet, obsessed with the destruction of the Russian navy, sailed also to the Baltic Sea to attack the proudest bastion of the Russian Bolshevik, the seaport of Kronstadt near St. Petersburg and to destroy the Russian fleet stationed there. Three British warships then left the Baltic for the White Sea where they spread destruction. Naval skirmishes also occurred in the parts of the Far East where the Anglo-French naval force besieged Russian forces and attempted a land invasion around the Kamchatka Peninsula. Finally, on September 11, 1855, the Russians blew up their forts and sank their ships and evacuated Sevastopol, defeated by western armies. They had won the battle of Balaclava but lost the war. In the eyes of some historians the major point is that the Allies fought the Crimean war not in favor of the Ottoman Empire, “the sick man of Europe”, but against Russia. Britain feared Russia would modernize its navy and threaten British naval supremacy in the world and was intent on giving Tsarist Russia a lesson. The war might have ended earlier but war fever had been whipped up by the press in Britain and France so that politicians were afraid to propose ending the war. But with the passage of time public sentiment in Britain changed to anti-war, and France which had suffered major casualties wanted peace. The signing of the Treaty of Paris brought an end to the war but not to Western hostility to Russia. The Black Sea was demilitarized, which weakened Russia, no longer a naval threat to Britain. Sevastopol and other occupied cities were returned to Russia which however had to give up some of its Danubian principalities and its aspirations to unite with its Slavic cousins in Bulgaria and Serbia still under the yoke of the Ottomans. Meanwhile in Russia great events, world-shaking events, were taking place. Yet for Russia the two preceding centuries of her history were more tragic than glorious. The history of the now more than two centuries was marked by the mingling of Russia and the West, above all by the drive of the West into Russia which ended in the many Western interventions in Russia several of which, as we have seen, were armed interventions that in the long run aimed at the total conquest of that new world. Weidlé notes that though Russia’s history had been full of movement, rich in events and achievements, it had never solved the problem of the integration of the various social groups into a common life. This integration, by the way, was also lacking in ancient Russia, in the new Soviet Russia and again today in a new Russia. Yet Russia attained a blend of order and disorder that fostered the normal development of a nation. In Russia that blend led directly to the Great Russian Revolution, perhaps because of the degree of those old separations of the masses from the hierarchy of the elite. Western observers have noted how in Russia the governing class and the people seem quite distinct. In fact, there have traditionally been two cultures in Russia: that of a very small elite and that of the masses, which lasted until the revolution and the enormous changes it wrought. When thinking of the Russian revolution, you should keep in mind that, desirable or not it eliminated the old elite and formed a new one. In the decades following the Crimean War revolutionary fever was growing in Russia. Finally Russian Socialists and Social Revolutionaries led the 1905 revolution that forced Tsar Nicolas to grant the establishment of the Duma, a legislative assembly, which marked the start of a kind of Constitutional Democracy and weakened the total power of the Tsarist regime. It seemed that Russia was truly destined to be part of Europe. Trotsky notes that despite the counter-revolution, an industrial boom came in 1910 and with it the strikes. The shooting of workers in 1912 gave rise to protests all over the country and by 1914 beautiful St. Petersburg had become an arena of workers’ barricades. It has been said that governments come and go but the police (soldiers too) remain. Moreover, policemen are conservatives because of the nature of their work. Trotsky knew that new ideas (he was referring to Socialism) always come early. Marxism considers itself the conscious expression of the unconscious historical process. But the unconscious historical process, in the historico-philosophical sense of the term, coincides with its conscious expression only at its highest point, when the masses break through the social routine and give victorious expression to the deeper needs of historical development. At such moments the highest theoretical consciousness of the epoch merges with the immediate action of the oppressed masses that are furthest away from theory. The creative union of the conscious with the unconscious is what one usually calls ‘inspiration’. Revolution is the inspired frenzy of history. In fact, as Trotsky had predicted there began a series of mutinies in the navy and the army. During the revolution, every fresh wave of strikes and of the peasant movement was accompanied by mutinies in all parts of Russia. Already during the revolution some Western Ukrainians became aware of the dangers to the central government in Kiev of the movement for Donetsk separatism from the Ukrainian state. The Novorossiya idea had never died. Ukrainian Prime Minister Arseny “Yat” Yatsenyuk announced to a conference of European politicians meeting in the Ukrainian capital of Kiev that “Putin wants to destroy Ukraine as an independent nation and restore the Soviet Union.” He added that his country is in a state of war and that Putin is the aggressor. “Putin’s aim is not just to take Donetsk and Lugansk. His goal is to take the entire Ukraine. Putin is a threat to the global order and to the security of Europe.” Yat does not want Russian to become the second state language. He wants European Union membership for Ukraine and opposes Ukrainian membership in the new Customs Union of Belarus, Kazakhstan and Russia, which Yatsenyuk believes would mean the restoration of the Soviet Union, albeit in a slightly different form and name. He accuses Russia of wanting to construct a new Berlin Wall, this time on the western border of Ukraine and the European Union. Before Russia annexed the Crimea, Yatsenyuk said the decision of Ukrainian membership in the European Union should be decided by referendum. Ukraine watchers were taken by surprise when Russian President Vladimir Putin used the term “Novorossiya” to refer to some regions in southeastern Ukraine: Kharkiv, Luhansk Donetsk and Odessa. “They were not part of Ukraine in Tsarist times, they were transferred in 1920. Why? God knows.” His idea could have been to ready Ukraine for absorption of those territories into Russia. At the same time “Novorossiya” is also the slogan of pro-Russia activists in southeastern Ukraine where people are chanting the Novorossiya theme. Such an event today would devastate the already shaky economy in Kiev with no money in its coffers. After all irredentism is the effort to reunify lost territories inhabited by ethnic kin with territories also inhabited by ethnic kin. Most certainly the USA, the EU and the IMF would not consider bailing out a country much, much worse off than was Greece. And if came down to the wire, sanctions and resolutions would not stop the unification of areas of ethnic Russians in Novorossiya, or the Transnistria republic and most likely also the whole of Moldova. If you need ( and you shouldn't) any more proof that we are in a global extinction event that will include us here it is. We have failed to protect the fundamental neccessities of life. Fresh water, air and clean oceans. 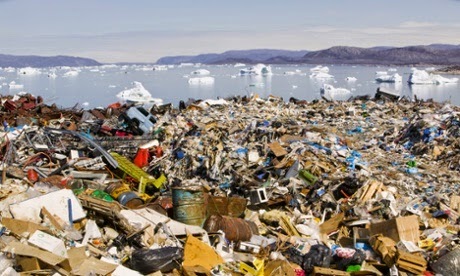 A combination of Anthropogenic climate change and callous human indifference have signed our fate. 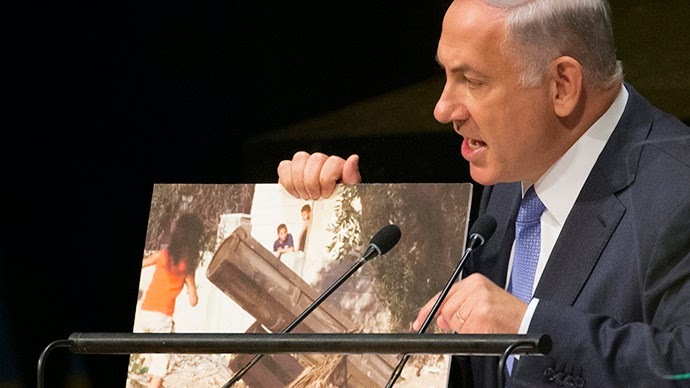 Bigger than the Islamic State threat – Iran and its nuclear program yet again haunted Benjamin Netanyahu’s address at the UN General Assembly. The Israeli PM also has photo-proof with him of Hamas using Palestinian civilians as human shields. “Make no mistake – ISIS (Islamic State) must be defeated. But to defeat ISIS and leave Iran as a threshold nuclear power is to win the battle and lose the war," Netanyahu said at the UN headquarters in New York. "Iran's nuclear military capabilities must be fully dismantled," he added. As for Tehran's recent “charm offensive” for the West, its true purpose is to see the international sanctions lifted "and remove the obstacles to Iran's path to the [nuclear] bomb," the prime minister stressed. He also slammed the countries, which now fully back US-led airstrikes against ISIS, but used to criticize Israel for their war against Hamas in Palestine. “Hamas’s immediate goal is to destroy Israel, but it has a broader objective. When it comes to its ultimate goals, Hamas is ISIS, and ISIS is Hamas,” he said. The head of the Israeli government put the blame for civilian casualties on Hamas, which, he said, committed “the real war crimes” by using ordinary civilians as human shields. He refuted claims by Palestinian leader Mahmoud Abbas, who accused Israel of conducting a “war of genocide” in Gaza in his UN address at the weekend. Netanyahu believes that Israel can’t be accused of genocide as it gave advance warnings to Palestinians before shelling neighborhoods in the densely populated Gaza area. Israel “was doing everything to minimize civilian casualties. Hamas was doing everything to maximize civilian casualties” by placing its rocket launchers in homes, schools and children’s playgrounds, he said. The PM also blasted the UN Human Right Council, which sends “a clear message to terrorists to use civilians as human shields” by condemning Israel’s actions in Gaza. The Human Right Council “turns the war upside down” and is deserved to be called the “Terrorist Rights Council,” he stressed. The Prime Minister also said that such common challenges like nuclear Iran and militant Islam provide a historic opportunity for Israel’s relations with the leading nations in the Arab world. According to Netanyahu, Palestine can be reached though good relations with Arab world, but not the other way around as many thought before. 'The earth is being killed"
The truth about the US "war on ISIS"
Police shoot dead their "terrorist suspect"